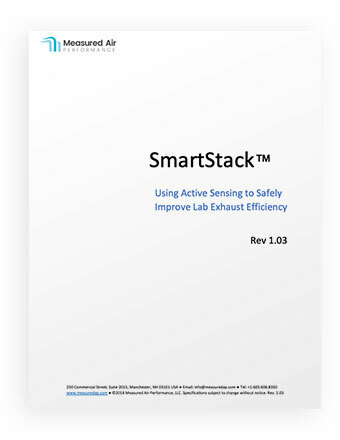 SmartStack™ is a proprietary, active sensing system that monitors lab exhaust air for 100’s of compounds. The system indexes the exit velocity of the lab exhaust fans based on the cleanliness of the lab exhaust air. It incorporates a patent-pending system that protects its sensors from over-exposure. This ensures reliability by significantly reducing sensor fouling and drift that normally occurs with exposure to high levels of contaminants, such as TVOC’s. In most labs, there are typically only a few active fume hoods in the system emitting limited levels of contaminants. These contaminants are significantly diluted by the relatively clean air that is manifolded from other locations. Although, the laboratories operate in these relatively clean states for extended periods of time, the exhaust fan systems run at high exit velocities (e.g., 3,000 ft/min or higher). As a result, these systems frequently operate at much higher total flow rates than required using significantly more energy than necessary. Many assume that exhaust fans are required to operate at 3,000 ft/min (minimum). 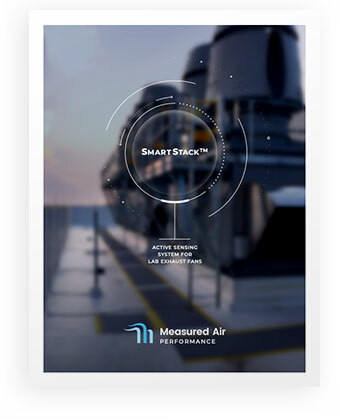 Measured Air Performance Partners with ANSYS Inc. Measured Air Performance (MAP) is pleased to announce its entrance into the ANSYS Startup Program. MAP can now incorporate innovative simulation capabilities into our customer support efforts. ANSYS is well known as the global leader in simulation software and its products play a critical role in solving the most complex engineering and design challenges. 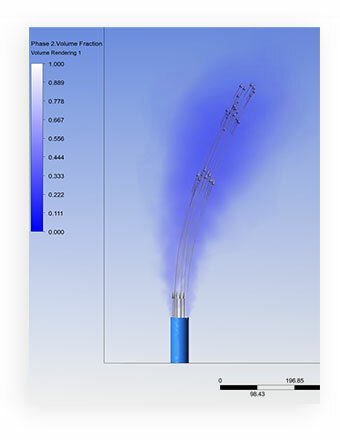 Through the use of FLUENT (ANSYS computational fluid dynamics -CFD-) software, MAP will provide more insights into lab exhaust configurations, the many benefits of Active Sensing, and the tremendous energy savings opportunity enabled by our SmartStack™ system.